and Action Gold Series 1/64 Diecast, by Lionel NASCAR Collectables Holiday, Christmas Fantasy NASCAR Diecast, designed by Sam Bass. 2011 Dale Earnhardt Jr #88 JR Nation / Sam Bass Holiday / Chevrolet Impala NASCAR diecast, by Action. Inspired by the Wild West town on Earnhardt's personal property, the scene features a buckaroo Santa and a decked-out cactus. This is a Holiday, Christmas Fantasy NASCAR diecast designed by Sam Bass. 2011 Kevin Harvick #29 Sam Bass Holiday / Chevrolet Impala NASCAR diecast, by Action. This #29 Chevrolet features Kevin and DeLana Harvick's three beloved (and now-famous) pooches Lo, Endy and Bebe, serving as Santa's little helpers. 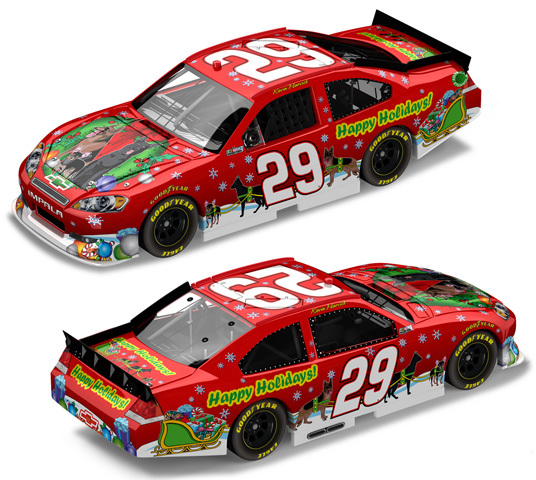 This is a Holiday, Christmas Fantasy NASCAR diecast designed by Sam Bass.